The shift from analogue to digital in the making of music and film is addressed in two recent feature-length documentaries fronted by major players in their respective fields: the Dave Grohl-directed Sound City and Side By Side, presented and produced by Keanu Reeves. Despite appearances however, neither film is really about the technology. Produced and presented by Keanu Reeves, Side By Side provides insight into the attitudes held towards digital technology by some of the most significant figures working in film today. Similarly, the Dave Grohl-directed Sound City, which takes the form of a love letter to the recently-closed LA recording studio of the same name, asks what the same technological shift from analogue to digital means for music. In Grohl's case, there's an added personal thread to his film: Sound City is where Nirvana recorded Nevermind in 1991, in turn contributing to a change in fortune for the struggling studio. Crucially however, despite being loaded with archival footage from the historic recording sessions taking place there, Sound City strikes out beyond what would have been pretty comfortable 'classic albums' territory to remain in and explores the wider implications on music making that digital technology has had. So while veteran rock legends Neil Young, Stevie Nicks and Tom Petty are at hand to recount the great experiences they had recording there, the film also gives an honest account of consistently unstable financial side of the studio's story, making it more than just a sentimental look back at the good ol' days. Grohl has previous form on the technology thing. His anti-computer tirade at the 2012 Grammys could have been more accurately aimed at the talentless rather than the tools, but for those in doubt, he reconfirmed his allegiance by describing the spirit of Sound City studios as 'about being badass and doing something real.' On one hand his film provides a welcome behind-the-scenes glimpse into how smelly and shambolic 'the place where the magic happens' can really be, but Sound City's occasional heavy handedness (the scene covering closures of the studio is soundtracked by Neil Young's 'It's over' refrain from 'Birds') also sets the tone to one of mourning rather than that of a celebration of the artistic impulse. Although both Side by Side and Sound City purport to be about the transition from one technology to another, you get the impression that what's being mourned instead here by some is the passing of a simpler time when people supposedly cared more, collaborated more and had more expertise - with the optional conclusion from this point being that a compromise in quality of future output is inevitable. However, when the frequently-made point that democratization without 'tastemakers' can only lead to a deluge of the mediocre is made in Side by Side by Lorenzo di Bonaventura (who brought us GI Joe and Transformers), it's difficult to regard the old way as being inherently better. 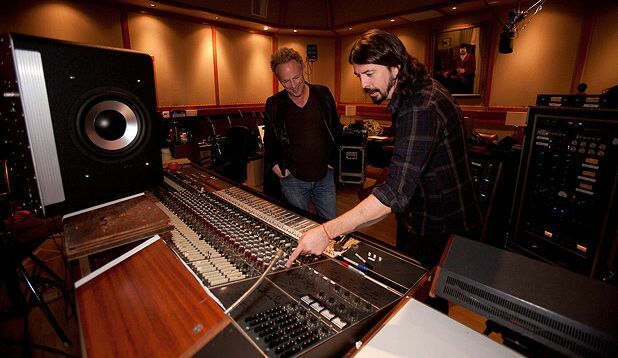 Similarly, the Sound City companion album (made by Grohl and Butch Vig on Sound City's mixing desk, which Grohl bought and rehoused on his own cavernous studio) may be heavy on high-profile collaborations, but is fairly pedestrian rock fare, however exquisitely recorded on vintage equipment the 'vibe' might be, with a sonic pallette pretty much unchanged since Led Zeppelin laid it out. Sound City studios also produced its fair share of entirely forgettable albums along the way, and although it's tempting to romanticize the creative process (which Sound City does in a wholly enjoyable way) it's also questionable how 'badass' it's possible to be when expressing yourself relies on having over $50,000 of record label money to pay for it. Foo man Grohl directs this love story to Sound City, a recording studio in the San Fernando Valley that put to tape albums by Fleetwood Mac, Neil Young, Tom Petty and Nirvana – to name but a few.